This activity is perfect for teaching students to listen, think, and comment on other's thoughts and opinions. 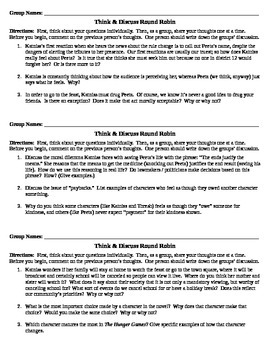 In this activity, the class is divided into 3 groups (more if you want to give each group fewer questions to discuss). In each group, students read their 3 questions and discuss each one as a group. The tricky part of this activity is HOW they discuss. Each student must listen to the person before them, comment on their response, then respond. One group member documents the conversation. Kind of like a LIT CIRCLE! This activity is a great reading strategy that I love to use in my class. These questions could also be used as essay prompts or discussion starters.